GIS Hero Sterling Harris with his hero Texas Ranger John Coffee "Jack" Hays, who was appointed US surveyor general for California in 1853. This article is part of an ongoing series honoring individuals who have made a difference in the world by applying a GIS solution to conservation or community challenges. Since these unique individuals have been selected for their innovations or special achievements, the series is appropriately named GIS Heroes. Esri recognizes Sterling Harris as a GIS hero. Texas is a broad, sweeping state—the second largest behind Alaska. Its geography ranges from bayous and beaches around Houston to rolling Hill Country and the desert landscape of Big Bend National Park in the west. It was the Texas Hill Country near Austin that ignited a passion for the land in Sterling Harris. He grew up in a ranching family, then worked in the oil and gas industry after graduating from Sul Ross State University. 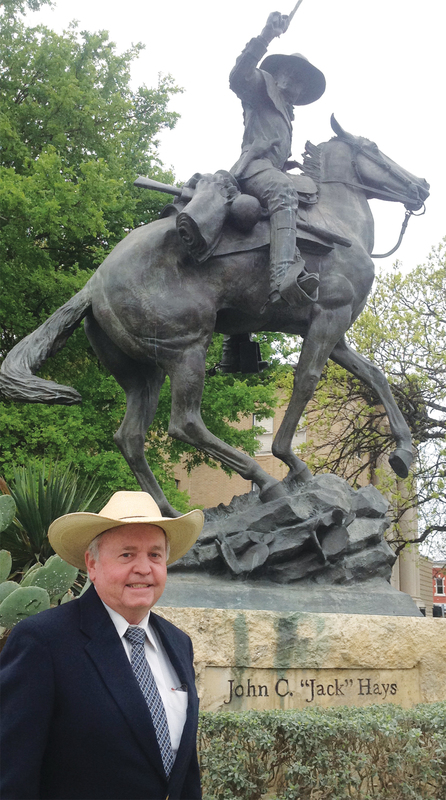 He began working in the GIS department of the Texas General Land Office (GLO) in the mid-1980s after a friend suggested it would be a good fit for him. The Texas General Land Office was established in 1836 to manage the state’s first land records. It still protects more than 35 million historic land records, but now its primary functions also include earning money for the state’s Permanent School Fund (PSF) from sales and leases of public lands and safeguarding the state’s coast. Texas is unique in the amount of public lands it owns. When Texas entered the union, the federal government would not allow the state to pay its debt with land. Texas owns more than 13 million acres of public lands, including submerged lands up to 10.3 miles offshore. To protect its coastline, the Texas State Legislature passed the Oil Spill Prevention Act in 1991. Funding from the legislation allowed the GLO to acquire GIS for contingency planning and response. Once he became the GLO’s GIS manager in 1999, Harris took the leading role in managing data development for the agency’s oil spill toolkit. This toolkit was developed in partnership with the Coast Guard and includes environmental sensitivity maps, local knowledge guides, and area contingency guides for the Texas, Louisiana, Mississippi, and Alabama coasts. First responders can use the atlas in the toolkit to see critical information, including where wildlife habitats are in relation to a spill. “The oil spill toolkit has been such a success story over the years and is a real standard for emergency response for the natural disasters that have hit the Texas coastline,” Harris says. In March, responders used the toolkit to manage the spill in Galveston Bay after a barge carrying fuel oil collided with a cargo ship and began leaking more than 160,000 gallons of oil. “I’m pleased that the hard work our GIS team has done over the years has made a difference in preparing and responding to major spills like this one,” Harris says of the incident. The state of Texas uses revenue generated from sales and leases of public lands to contribute to the PSF. Interest earned on the fund, approximately $800 million per year, is distributed to every school district in Texas. 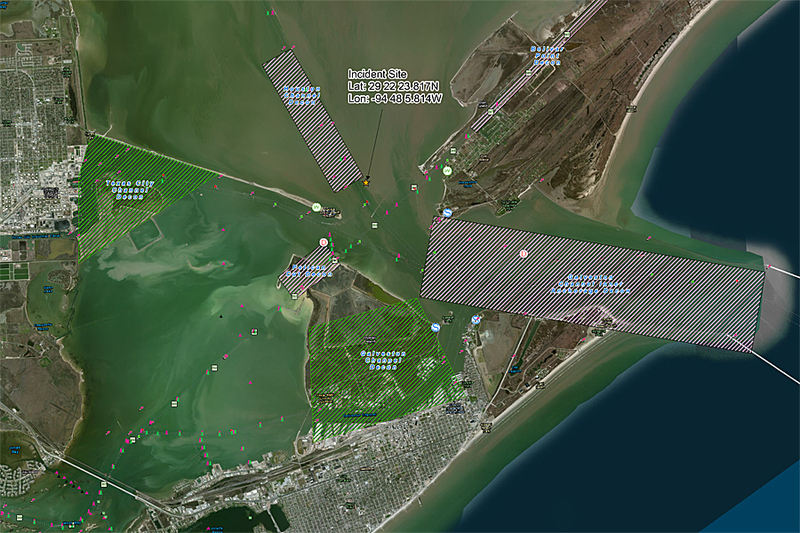 This Texas City "Y" Spill Decontamination map depicts the ship channel impacted by the spill event. Cleanup operations are ongoing inside this area near Galveston, Texas. Soon after becoming the GIS manager, Harris started populating the Original Texas Land Survey (OTLS) data layer with Permanent School Fund Trust Lands attribute information. He created a public-private partnership with Tobin P2 Energy Resources to acquire the OTLS layer. For two and a half years, he and his team pulled all the records from the GLO file vault to verify each record showing mineral and surface interest for each tract in the PSF inventory. The OTLS serves as the base layer on which all other GIS layers, including oil and gas leases, grazing leases, permits, and miscellaneous easements layers, are built. Under Harris’s guidance, GLO also created the public-facing GISWEB Viewer, which includes OTLS boundaries, PSF lands, leases, oil and gas well locations, and imagery. The underpinning of all Harris’s work with GIS has been a desire to make life easier for people—for the staff in GLO and the citizens that do business with the agency. Staff members, including those in Professional Services, Oil Spill Response, Surveying, Coastal Resource Management and Energy Resources, use GIS in their daily work. This is quite a change from the days Harris remembers when nobody knew what GIS stood for. Once he and his team began creating applications that staff could use, people were empowered with direct access to spatial information. “Where I’ve seen the greatest achievement is getting people to use GIS every day in their work,” he says. Giving the public access to the vast collection of spatial data in GLO is also a key function of the agency in Harris’s mind. A wealth of downloadable GIS data is available on the GLO website, including leases, pipeline locations, and priority protection habitat areas. Oil and Gas Lease Sale Nominations data allows companies to see land that they can bid on. In addition to the oil response toolkit and the GISWEB Viewer, Harris is behind online maps like the State of Texas Oil Spill Response Mapping Tool and Homeowner Opportunity Program (HOP) Area Locator. HOP is a disaster recovery housing program for those who live in Federal Emergency Management Agency-designated high-risk areas or areas of high minority and/or poverty concentration. Harris’s enthusiasm for GIS has made him an early adopter of new technology. He is excited about how GLO is using ArcGIS Online and Collector for ArcGIS in the agency. In the works now are geographic response plans for specific waterways. For more information, contact Sterling Harris, GIS manager, Texas General Land Office. MOOCs, GIS, and Online Education: Quo Vadis?